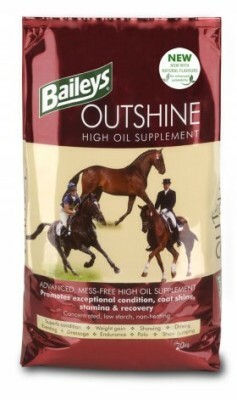 Outshine is an extruded nugget that combines oils from soya and linseed with supporting nutrients, including important anti-oxidants, plus super fibres and Digest Plus prebiotic to produce a high oil supplement which can be fed to promote weight gain or stamina or simply outstanding coat shine. Soya oil is rich in Omega 6 fatty acids, whilst linseed is an excellent source of Omega 3 so Baileys Outshine combines them both to give an optimum balance, avoiding the risk of an imbalance from feeding straight soya oil or boiled linseed. 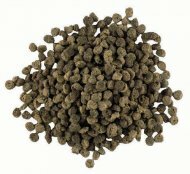 Oil is a concentrated source of slow release energy, however, the more oil that is included in the diet, the more antioxidants the body requires to deal with the free radicals produced during its metabolism. Outshine contains additional antioxidants in the form of vitamins E and C, as well as selenium and zinc, to support the safe and efficient utilisation of the oil by the body. 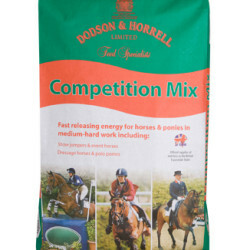 Its extruded formula mixes well with compound feeds and straights alike, is appetising and easy to handle. 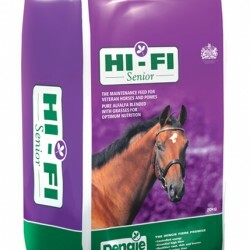 Fed in small quantities Outshine is particularly useful for increasing the “non-starch”, slow release calorie content of the horse’s diet without significantly increasing the volume fed.